Hello everybody, here is a place to post all your muskie reports and muskie pictures for people to enjoy. Here's my report from the MN muskie opener. Fished today from 8:30am to 8:30pm today. We had sun this morning and then turned to wind and rain. Water temps were 58 to 62 depending where we were. We did see a fish unitl 4:30pm the I boated a super thick 47.75 incher. Dusty was also out, he had two on on top raider but both came unbuttoned. I'll have pics up soon. Hey Pete this is Matt from Morgan Park. I've talked with you a couple times in the hallways. Anyways we were out also and saw you a few times going from spot to spot. We only saw one fish all day but it hit on a figure 8 on a Showgirl. 47.25 My new PB!!! We'll be out all day tomorrow maybe we'll see you out there. Pete and Dustin; Hit the river early Saturday Morning, missed a big stubborn girl and 10 minutes later boated a mid 30's. Water temp was 59deg by my graph and fish didn't seem to move till the sun was up for an hour. See's you on the water (no today though) and goodluck. Wonderful Weather we had in Duluth this weekend, windy off the lake, but did mange to put a 40" in the boat yesterday. Nice fish guys, Matt congrats on your fish nice PB, the summers early, go beat the water for a bigger one. Thanks for your posts guys. I was out yesterday in the wind, Water temps are 58-62. Looks like I won't be out today, high winds, rain and 37 degrees right now...burr!!! If the weather breaks things might change. 52 X 24 and 51.75 X 25!!!!! Boom goes the Dynomite!! Well we got the warm weather that we needed and the fish responded well!! Last night I only had one follow but it was a nice one high 40's to 50. I went back on the same fish this morning and bang!! 52 X 24. About an hour later Dusty calls me and banged a 51.75 X 25!! I saw 2 more fish one about 50 and another about 40-41 all fishing by myself until this evening when my wife jointed me. Dusty and I'll have pics later tonight after we down load. I hit it today for 5 hours and continued my streak of follows, short strikes, and no fish in the boat. Gotta love musky fishin'! Had two great clients out on Saturday afternoon and manage to boat 4 muskies. 2 on Top water, one on a Big Heavy Bucktail and one twitching a crank bait. Congrads to Jose and also his father in Law Leo, on there muskies and we had lots of fun with 3 of the muskies eating on the L turn boatside. Guide trips are filling up for this summer, if interested give us a call to check for availability. Where are you guys finding the pigs? Weeds? Rock Reefs? Steep contour changes? The few fish that I have boated this year have come on weed flats, and have all come on top water. I had 3 or 4 decent fish follow or strike over the weekend, and finally put one in the net, a beat up 31" on a Creeptonite. Pretty soon I'll stick one of the bigger ones! Finally we are seeing the water temps hit 70 degrees in spots. Keep moving around to find that early cabbage, in spots touching the surface, in other spots it has not hardly started to grow up yet. Had a great guide trip with 2 guys from the Cities on Sat, managed to only boat one 41" but saw a bunch and lost 3 others. Big fish keep coming! As the water temps warm we have seen a great spike in big fish activity. This big girl was 49.5. Here are some pics. I've been out everday this past two weeks through wind, rain, heat,...and the fishing is going good. I'll have picks soon here are the numbers 43.5, 48.25, 41, 41.5, 44, 46, 41, 41.5, 42, 42.5 hybrid, 47, 46 hybrid. I'll try and get some pics up. Got to run muskies are biting!!!!!! Muskie Action is heating up for the Summer, even though the water temps have fallen since saturday, the Muskies have and are moving into there summer patterns. I had a great past couple of days fishing with Clients From Iowa, Chris, Nick & Dave. Great guys and they said who needs to go to Canada to catch big muskies, After 2 days of heavy pounding the water, 9 fish boated, lost 7 fish and 8 follows. Gotta love it when they are in feeding mode. Baits we used were Big Heavy bucktails & topwater was money for us. Would like to thank Chris, Nick & Dave for a great time on my boat and see you next year. As you can see Pete & I have been pounding fish in the past week & all season! Give us a call today to book your monster muskie Adventures, dates are filling up for the summer so give us a call for availability. Muskies kicking into full gear! I've been out checking new water with great results. Here are some numbers from this past week. 42, 37, 34, 48, 47.25, 45, 45.5, 38, 40, 52.25. Nice to get out and not see other boats. This time of the year is the time to get out and explore some new waters, fish are up and moving well now. I'll post pics in the near future. Take a kid fishing because these two kids are now Muskie hooked!!!! The summer bite as you can see Pete, Bob & I are boating lots of fish, focus on the summer spots and you will find muskies. Also like pete said we are catching more fish in new spots that are not getting hammered by the daily community spots. The Bite on Vermilion is heating up, so give us a call to book your trip, many weekends are booked up but we do have weekdays available, call for dates. I like the background Jeff. Actually all my pics that I post from now on will have the backgrounds blacked/colored out. I've had many people comment on backgrounds and things seen islands, points, train tracks, ect. in the backgrounds that make many spots known to others. The pictures are about the fish not whats behind them. We and all muskie fisherman put in alot of time to find good spots that produce fish consistantly and why should they be wrecked because we are proud of what we caught and want show some pictures. What do you guys think? Anyway nice fish Jeff! Keep chucking baits and Cast Farther, Reel Faster. I don't see a problem with the hidden backgrounds, especially for someone like Pete or Dustin who put in some serious hours finding those spots. I'm glad I get to fish on fridays before the crowds head out. I had someone zip over to a spot I was at on sunday. I think it would have been a little more classy for them to have waited until I was gone. Oh well, it was a new spot for me anyway...hopefully they snagged up as many times as I did. I laughed pretty hard at Jeff's background! Well summer has not yet arrived in the north country, They said it is the coldest July on record, the night bite in the north land has been slow, but the muskies still got to eat. Bottom line when it is a little slow we have still found ways to get them to eat, and put fish in the boat. I wanted to thank some great people that have been in my boat over the past few weeks and had some of there best days ever. also Fuzzy with his largest also to date a 49 too. The bite all around NE MN has been very good the past 3 weeks. The Big V Is really starting to heat up with some Big one being caught buy us, with a 55.5. Call to book your trip today. Sometimes it pays not to pay attention. My dumb luck 47". We are heading into fall full steam ahead. Fishing continues to be good. I really started to notice definate feeding windows that open and close this past week. So save to high fives and backslapping for after the window closes, keep casting and stab another one. Here is a pic of 53.5 that I popped, was nice to have my sister and good friend Nick in the boat with this one. Last edited by Pete Brzezinski; 08-31-2009 at 03:55 PM. I went out with Dustin earlier in the week and he did an awesome job putting us on some fish. I tried piercing Dustin's ear on the first fish when the hooks let loose and the lure came flying straight at his head. Luckily he watched the event unfold and was able to duck out of the way. The next fish was this healthy 46.5" that ate at the boat on the turn. Dustin picked up another fish and we had another two follows.......all within 3 hours. Thanks Dustin!! 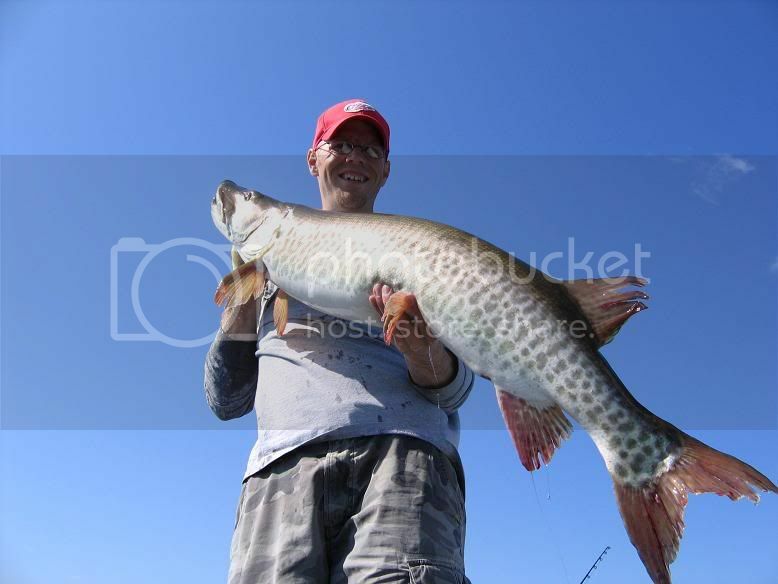 Here's a photo of the 99th muskie for me this season over 35 inches. 9th over 50. This one was 50 inches on the nose. What a great year so far! Still have some room this fall for some sucker action. Here are some fish pics from this last weekend. Lakes turned in the Hayward area and the water is settling down 46-48 temps. Boated 4 legals this weekend some nice fish in the mid and upper 40's. Last edited by Pete Brzezinski; 10-15-2009 at 12:03 PM. Congrats to Taylor and Colin Murphy on their six fish day with me yesterday. Casting took the stage today with some warmer weather. Twich baits and rubber where both hot. We boated 6 legals and lost 5 other fish. Only one fish on a sucker today. Water temps in the Hayward are around 46-50 depending on the lake. Here are some photos yesterday. Last edited by Pete Brzezinski; 10-15-2009 at 12:04 PM. Well, we haven't seen this for a while at least in northern Wi and MN...last year at this time I was ice fishing for walleyes on six inches of ice. If a guy can pull himself out of the deer stand or off the couch and away from the NFL, the muskie are still going good and it looks like we'll be out until Nov. 30 this season. Suckers have been the go to. One, because at this time of the season I'm sick of casting over the six months and Two, the muskies eat'em. I'll report after the season with pics and a final muskie tally. It's been one hell of a year for me with numbers and BIG fish. Well I fished all the way through November 30th. The last day we had to hook-ups on suckers but none in the boat. Only got to fish from 2:30pm to dark. I had around 180-200 muskie enter my boat this season and 13 fish broke 50 inch mark this season. Well we are on the eve of the eve before muskie season opens here in Northern Wisconsin. Water temps. are up, fish should be active and willing to run some baits down. New weed growth and forage are things to look for as the season kicks off. Keep the reports and pictures coming it’s nice to hear and see success of other anglers. I’ll try and report after the weekend.